& from Republic of Ireland / Éire including Worstead. It's a little known fact that this wonderful album was released twice in Japan during the 1960s. The first (this pressing) was in August '68 and carries the catalogue number SLPM-1398. It was quickly repressed and reissued in 1969 with the catalogue number prefix changed to SMP-1398. Both issues have sleeves, labels and obi's with their respectively revised catalogue numbers - if you're lucky enough to find one do make sure all the numbers match. This first ever Japanese issue is in far above average condition for such a rare pressing & is a worthy addition to the collection. The unique sleeve artwork depicts a seated Jimi wearing a cool pair of rainbow striped trousers. The only psychedelic touches are the flame shaped 'speech bubbles' containing the album titles. The heavy duty pasted picture sleeve is of solid construction. There is some foxing evident to the white back of the sleeve and a couple of light spots to the front are also just visible. Elsewhere, with a little scuffing at the spine and a couple of small creases to the corners of the opening edge, the sleeve appears in otherwise excellent condition. As is usual for a 60s Japanese pressing the lyrics are printed on the back cover. However, since they would not all fit in the space provided, they end with the first line of 'Ain't No Telling' and then continue on a separate one-sided full size insert. This continuation lyric insert is in excellent condition, there is just one small 5mm nick to the bottom edge and a couple of tiny brown spots are also evident. With light spindle marks around the centre of the red Polydor labels and only a couple of hairline cosmetic surface marks evident, this copy does show signs of being played however, the play-wear is kept to a minimum and appears in otherwise really nice condition. There is no obi with this record. To put some perspective on that we have only ever seen the obi pictured in reference books, never for real and suspect a mint original complete with insert and obi would fetch at least three times the price of this copy. In summary, this is a superb example & for its rarity it is about as good a copy as you are likely to find. If you don't already have one in your collection it's worth buying for the sleeve art alone. Trivia - the actual trousers that Jimi is wearing in the photo on this record cover were auctioned in London on July 10th 2008. They fetched an incredible £20,000! 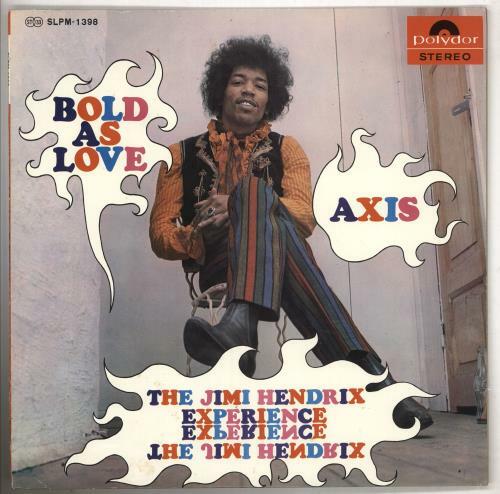 Product Information Jimi Hendrix Axis: Bold As Love Japan vinyl LP album (LP record).